That was a long dry spell there… both flying and writing. It all started with an extended annual inspection on the Swift. Just as I was about to get it all finished I made a dumb mistake that required sending my prop out to be inspected. That resulted in the need for a new hub for the prop. By the time all that was completed we had entered into the winter of 2016-17 which was one of the wettest we had experienced in decades. It was great for the skiers and filled all our reservoirs to capacity…but it made it hard to get over the Sierras and pick up the prop from the San Francisco bay area. Well, I finally got it all back and the plane back flyable again. But by then both my medical and flight review had expired. I wrote about all that back in June. So, I finally got back into the air and regained my landing currency on the first flight. There was definitely some rust knocked off during the flight but that was expected after a 1-year layoff from flying the plane. My next flight was to give a friend a ride. That didn’t go so well. Unfortunately the next landing resulted in an off-pavement excursion and a bent airplane. Luckily I had very good insurance coverage – the active work being ‘had’. 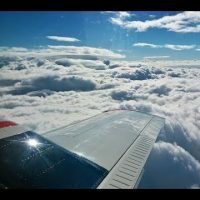 The insurance company I had been using refused to re-insure me after I filed a claim – the rejection reason was stated as ‘claim history.’ The first claim in 49 years of flying. I won’t get into the incident details other than to say that there was sheet metal damage that had to be repaired, the engine was torn down and inspected and a new prop was purchased. The ‘good’ news is that while the plane was down being repaired I worked with the maintenance facility to do the work needed to replace the instrument panel in the cockpit while the exterior repairs were being accomplished. I had a blank panel on hand, decided where I wanted all the instruments and cut the metal. I pretty much just re-arranged the instruments I had and put them into a more logical (six-pack) order with a center radio stack and added instrument lights (Nulite LED). of things to do…. instrument lights, turn coordinator, ADS-B, engine analyzer, etc., etc., etc. Making a really long story short, I got the plane back in my hangar in mid-December. I had a new transponder check done by the local avionics shop – passed first try. Then I went for a flight and got my landing currency back…again. The next flight I motored around the Reno Class C airspace for 45 minutes. After the flight I queried the FAA website for an ADS-B performance check. The new installation passed all their checks and I now have an ADS-B certified airplane. For those of you who are interested, I went with the Appareo ESGi installation for an ADS-B solution. It includes their ADS-B transponder with built-in WAAS GPS for the ‘out’ portion and a Stratus 2i receiver for the ‘in.’ The 2i sits behind the instrument panel on a shelf next to my altitude encoder. The 2i does not have a battery or GPS. It is connected directly to the transponder and receives its power and position information from the transponder. It automatically powers up whenever the transponder is turned on. With the 2i installation I now only have my small battery-powered SPOT tracker velcroed to the aircraft glareshield – much cleaner and no visible cables other than the lighting cable for my iPad connected to the aux power outlet behind the seats. 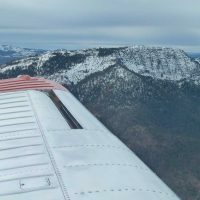 I flew a couple more times when we had good weather in the end of December and then made a trip down to the California valley to Willows (KWLW) for breakfast on January 1st. 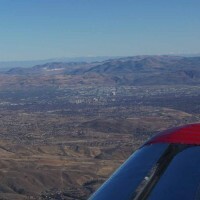 The Corning, CA EAA Chapter (1148) had a New Year’s Day fly-out for breakfast so I tagged along. Probably had 8 planes from Corning and two from our chapter (1361) in Reno. One of our members with a beautiful RV-7 came down, too. Anyway, that is what has happened in the last 18 months. A lot of frustrating, non-flying time but in the end the Swift is in better shape than when it started. I still have a short list of minor things to do (always) but the plane is flyable. Right now we’re in the middle of a pretty wet storm system but everything ought to clear out by the weekend. Unlike the rest of the country our temperatures are still getting up to the low 50s so there is some flying planned for this weekend. "Flexible is much too rigid; in aviation you have to be fluid."